The week of Thanksgiving can always be a bit hectic and harried for most of us, especially if YOU are the designated chef for your family and friend's holiday dinner. I can speak from experience, when I say that this week is already filled with multiple trips to the grocery store(s) to hunt down all things gluten-free for the Thanksgiving table, so creating additional meals leading up to Thursday night can easily take a back seat. I came up with this delicious and very easy GF Pizza that the whole family will love, or if there's leftovers, you can simply freeze or reheat what's left. The trick to a crispy crust is to thaw the pizza for about 20 minutes, then glaze with olive oil and bake for 5 minutes at 450 degrees. Take out the crust from the oven and let it cool for a a few minutes, then spread on the pasta sauce. 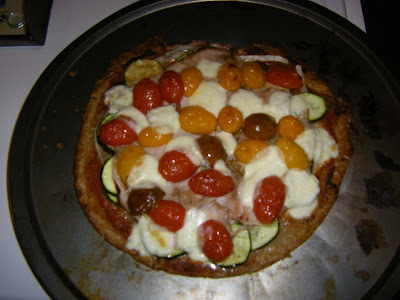 Layer the turkey, then the sliced onions and zucchini, then peppers and lastly, half the tomatoes and mozzarella and arrange on the top of the pizza. Lastly, drizzle the vinegar over the top of the pizza and Voila...ready to pop in the oven. I bake my pizza at 400 degrees or whatever the directions on the box require, checking every five to ten minutes. I have found that my pizzas usually require a bit longer oven-time than the directions call for. Use your best judgement, but testing the softness of the zucchini is your best bet for gauging its readiness. Give it a try and it's sure to be a pleaser and definitely won't require you putting hours in the kitchen - you can save that for Wednesday and Thursday! Have a wonderful and blessed holiday with family and friends and remember, don't even think about cheating on anything that's not gluten-free! It's so not worth it! Baking and cooking can be magical sometimes and have the ability to take all of our cares away and transport us completely into "the moment"...where one is solely focused on the creation at hand and the world just seems to melt away, similar in a way to the dark Dagoba chocolate dripping down the side of the photo above. Okay, I'm pretty excited to take credit, along with my lovely mother, for the scrumptious Black Bottom cupcake we just had to photograph ~ seeing is believing! Now, this isn't just any old cupcake, it's one of the goodies we learned how to bake last Friday night at the Whole Foods Gluten-free baking class we participated in, along with close to ten other Celiacs and supporters of loved ones with Celiac, in the Reno area. The class took place inside their beautiful Culinary Center and was three hours of sharing, learning, baking and the best part of all - EATING. I've learned throughout the eight or so years since I have been diagnosed, about the importance of "community" when you are a Celiac. I must say that there is real power in gathering together and sharing each of our individual stories...stories that led us to gather 'round a table, just as it did the night of our baking class. Our exuberant hostess and chef, Stacy of Whole Foods, asked us all to gather table side for and introduction of sorts and a chance to share each of our stories about being diagnosed as a Celiac and what we have learned. I always find each person's tale of great interest and usually learn that I'm somewhat of a "veteran" when it comes to the amount of years we've all be diagnosed. So that evening we went around the table sharing our journeys and struggles and all that we have learned and are so eager to share with one another. There's such a feeling of commrodory that comes from simply acknowledging what each of us has lived through and some of the residual health issues we might still be facing, but it's always, always a positive and beneficial discussion, no matter the group gathered. 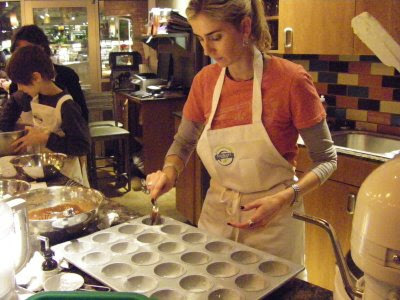 One of the younger woman attending our baking class had just been diagnosed two months ago, after what sounded like years of struggling through some rather unpleasant health issues. Her husband came to join her for support and as he explained, to learn how to be more understanding of what it takes to live with a Celiac and to have compassion. As I listened to her story I was struck with a great sense of empathy for this woman, remembering as we all can I'm sure, the first month after being diagnosed and the dreaded task of walking into a grocery store armed with lists of "do's and dont's," somehow muddling from aisle to aisle reading every label five or six or seven times to make sure you got it right! I must say that being diagnosed in 2008 sure offers another universe of products and information, beating the heck out of our choices five or ten years ago, but with that said...it's all relative. A new diagnosis is daunting to say the least, regardless of how many flours and products are safely labeled and on the shelf. Back to our delicious baking class. The first part of the baking class was how to blend flours - four different blends to be exact. This can be tricky I've learned the hard way, so learning a bit about combining other proteins and starches to perform the same job as the missing wheat was very helpful...and walking away with some great flour blend recipes was even more helpful. I'll post all of these later for you to try. It's quite a science I am discovering, to get just the right combination of flour, xantham gum or guar gum, vinegar, etc. in order to get your GF goodies to rise to the occasion. We broke up into teams, each two or three-some assigned to either a scone(s), spritz cookie or my favorite, the black bottom cupcakes. As we set to the task of creaming, folding and the scraping of bowls, I had this sudden sense of joy come over me and fill me all the way up to the top with happiness. There I was, baking with my mom and laughing about how the cream cheese measurement couldn't possibly be correct, meanwhile the mother-son team next to us went about creating some delicious scones and might I add how talented an eleven year old boy can be in the kitchen! As we sipped some Whole Foods brand wine and chatted loudly with one another the whole scene just felt so natural and effortless and yes, FUN. Throughout the class we would all mingle to check out one anther's progress and spy on what the other was creating - all the while "oohs and ahhs" could be heard and compliments were flying. I noticed how we all would spontaneously share our own anecdotes for living a healthy and abundant gluten-free life and how supportive each and every one was to the other person- too bad the world couldn't operate on the same level as our baking class - with kindness and support. As goodies are rotated through the oven and out onto the counter top, we would all gather around the hot baking pans like children on Christmas morning, so eager to see what Santa had left. The one thing I always get a kick out of when attending any Celiac function, is standing back and watching how excited everyone becomes over a fresh ANYTHING out of the oven...it's like controlled chaos and let me say, we don't hold back...I mean, we're polite and everything...but a bit aggressive when it comes to ensuring that our plates are overflowing with fluffy, tasty treats! For example...my take home container of joy. Our class was so enjoyable and informative that we all voted to have another - so stay tuned and I'll keep you posted on the upcoming details. We were all inspired by delicious goodness. 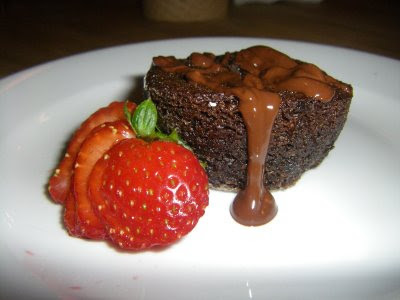 And not only will a hot, gooey cupcake keep us coming back for more, but so will the connections and friendships that are made in a simple class like this one, or connecting on-line with another Celiac and sharing tips with one another or a favorite restaurant. It's never been so clear to me as in this year since I began this blog, the need for community and how you can befriend a perfect stranger on the Internet just because you both have this funny auto-immune disease that won't allow you to absorb and digest wheat. I've become fast-friends with a gal who lives back east and had found my blog site. Through a connection to my hometown of San Francisco and our enjoyment for sharing GF tips with one another, we now have a genuine interest in each other's well-being and it all began through an email asking for some advice on living and managing life as a Celiac - these are the connections that brighten my day and remind me that the world is truly is small, and we are not isolated at all - quite the contrary. 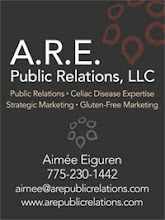 All this is a round-about way of suggesting that the world of Celiac is vast and growing each and every day, so jump in and use your baking knowledge and general understanding of this disease to help someone who was just diagnosed or simply needing a new recipe...like this one. Preheat over to 375, then cream butter and sugar together until light and fluffy. Blend in egg and egg white, scraping down the sides of the bowl as necessary. Mix flours into the mixture just until incorporated. Line cookie sheet with parchment paper. Fit a piping bag with a #6 inch star tip, folding over the top of the bag to form a cuff. Fill the pastry back with the cookie dough. 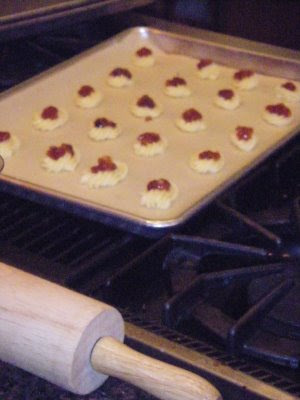 Pipe the batter into the shapes the size of a quarter onto the prepared cookie sheet then garnish the center of each cookie with a small dollop of jam. Bake for approximately 10 minutes or until cookies are lightly golden brown. It's all about baking really great goodies to share with those you love. 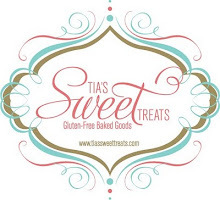 What are some of your favorite Gluten-free goodies? Well, it's almost holiday time and that means the ever-impending onslaught and mass abundance of goodies and sweets that begin to appear in all corners of the office, at social gatherings and everywhere in between. For Celiacs, the holidays do seem to pose their share of hidden dangers and holiday blues, especially because eating anything "mainstream" is on the no-no list...but have no fear, the answer is here...well, that is if you live in the Reno, Nevada area. 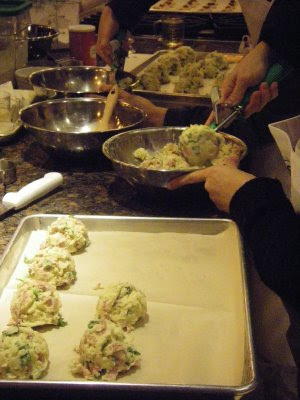 Whole Foods Market in Reno (and I'm sure all over the nation - check with YOUR local market) is offering a "Gluten Free: Savory and Sweet"(Hands-on)baking class this Friday, November 14th from 6 p.m.-8:30 p.m., in their Culinary Center located at 6139 So. Virginia St. They are charging $25 per person which includes all instruction and baking materials/ingredients. The evening class promises to make "sweet" dreams come true, as the culinary staff will be guiding us through the steps of how to bake a Black Bottom Cake with Cherry Compote, Cheddar Cheese Scones and delicious Chocolate Chip Cookies - now what Celiac could pass that up - not I! See you there - and 'tis the Season! It's not often that a Celiac is able to walk into a lovely Italian restaurant, or restaurant of any kind, and sit down to order gluten-free pasta that's made to order right off of the regular menu! 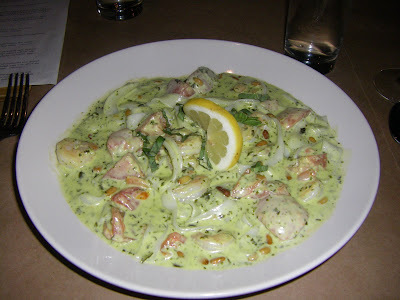 Well, recently it was my lucky night as this delicious "Genoa" shrimp, pesto-cream, and pine nuts with gluten-free fettuccine pasta dish you see above was just what the doctor ordered...and it was fantastico! The pasta was light and held its shape perfectly, and the entire time I was eating this savory dish I kept pinching myself that this was a gluten-free dish being served in a terrific and authentic feeling Italian wine bar, in the U.S...for a minute I thought I was back in Italy - it was that good. I was able to order this wonderful dish at a Boise restaurant, Asiago's Italian Restaurant and Wine Bar on W. Main Street. It's quite a savvy and hip eating establishment with a cool bar and wine cellar used for dining and wine tastings. Asiago's also has enjoyable window seating and a lovely patio that opens up onto the street...did I mention the enoteca-styled interior with a mural of "the boot"...AKA..Italy carved out nicely on the main-facing brick wall. Delizioso! If you are a Celiac or not - definitely visit the lovely Asiago's Wine Bar and enjoy feeling like a "normal eater," as you order off the large two-paged menu and for an hour or two, feeling like you're dining abroad. Last week I created a new gluten-free Taco recipe and thought I would share this tasty and spicy Mexican dish with you...and it is also happiness in a bowl or on a plate. We decided on chicken tacos with 100% corn tortillas, along with tasty black beans, some fresh-seasoned rice and yes-oh-yes...Sangria - Ole! 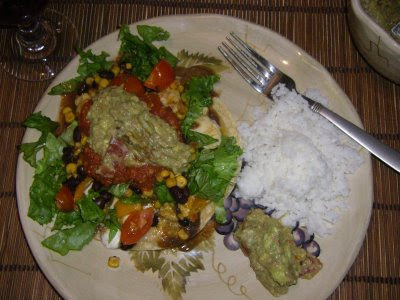 I prepared this chicken taco dish with a bit of a kick, though I didn't actually realize how much of a kick...pheeeew! 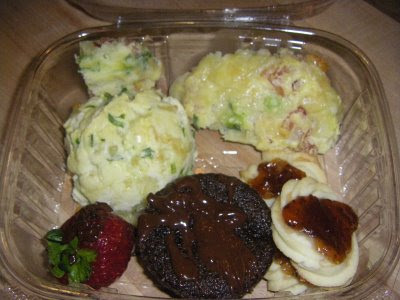 It was a simple meal that can be added to or minimized according to your individual taste buds~ Serves 3-4 people. First, I would prepare the rice in your steamer and get that started - takes about 20minutes...then I simply browned the onion and then chopped up up the chicken breasts and placed them in the skillet with the olive oil and a bit of salt and pepper. Let the chicken start to whiten on the outsides, then add in the chopped peppers and sautee for 10 minutes, stirring every few minutes to keep from browning too much. After 10 minutes (or when the chicken is well on it's way to being cooked) add in the chile verde sauce - now, I unknowingly used the entire can and though tasty, whoooo, light'em up baby. I would advise using 1/2 the can...or to your preferred taste. As the chicken is cooking to perfection, combine in a saucepan the black beans and corn after draining both and let simmer on low-med heat. Then chop the tomatoes, avocado and lettuce and place on separate serving plates and shred or crumble the manchego cheese and voila...your toppings are ready to go. I also highly recommend making some guacamole to top off your taco/tostada dish. Lastly, steam your tortillas or make your own like I did - muy bueno! Then it's the fun part - the creation of your own tacos! Do you layer with beans first...or cheese and then the rice, or perhaps you start with the delicious chicken verde and then pile on the goods - it's all up to you and rest assured, it most likely tastes equally delicious in the tummy, no matter how you stack it! Just don't forget to add salsa and plenty of guacamole. Your taste buds will thank you. 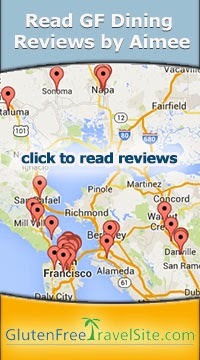 If you have a favorite GF taco recipe - please share them.